The Zimbabwe coup: A Chinese play for mineral riches? Wednesday sell-off short lived… inflation and compound interest… official narratives and “fake news”… and more! 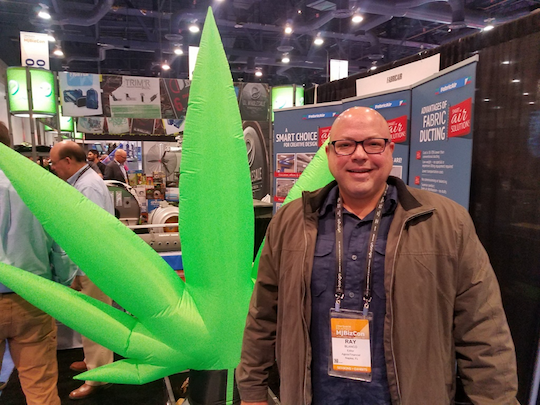 “The big picture still looks great for marijuana stocks,” says our Ray Blanco — who’s carved out a niche as the newsletter industry’s foremost expert on the topic. Ray knows the Las Vegas Convention Center well, given his regular attendance at the Consumer Electronics Show. “Make no mistake, MJBizCon is much, much smaller than CES. But the fact that the cannabis industry’s main event has grown to need one of the biggest convention spaces on the planet is incredible. 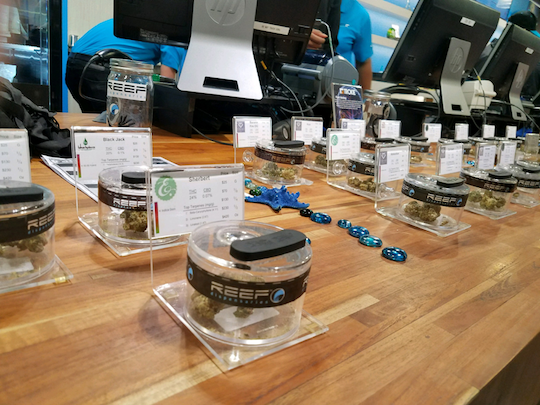 “I also took a field trip to one of the major dispensaries just off the Strip to see firsthand how legal recreational pot retailers operate in 2017,” Ray says. Only Apple stores don’t typically have armed guards. “Remember, since pot is still federally illegal, it’s a cash business,” Ray says. “Most credit card processors won’t take the risk of giving a pot dispensary a merchant account. All that cash makes dispensaries a lucrative target for criminals, so one side effect of that is lots of visible armed security. What’s happening in Nevada spotlights a changing landscape for pot stocks. It’s undeniable that “some of the more successful pot stocks have started to pull back and correct as we push into the fourth quarter,” Ray says… but at the same time, “looking at 40 of the top marijuana companies listed on the Nasdaq, we can see 62.5% are showing positive gains through the first two weeks of November. “The summer uptrend we saw is still in play for the overall market. We’re just seeing a shift in who’s benefitting. “That shouldn’t come as a surprise — after all, pot revenues are absolutely exploding for legal pot companies in markets in the U.S. Nevada’s pot sales essentially doubled the numbers of other states, with more than $27 million in sales. Those numbers come in spite of the fact that Nevada faced huge supply shortages due to issues with distribution rules. And if New Jersey comes online soon — as we said last week, the incoming governor is keen to legalize in his first 100 days — one industry observer projects the biggest cannabis industry per capita in the world. “There’s a lot of low-hanging fruit in the legal pot arena right now,” Ray goes on. “Many of the stocks previously priced too high to move on have fallen to more reasonable prices. “Couple that with new states expected to soon come online with legalized pot in the months ahead and you have major uptrend potential. We have a pretty exciting situation on our hands. In fact, Ray says now is the best entry point for these stocks in years — comparable to when Colorado became the first state for legal recreational cannabis in 2014. If you missed out then, here’s your second chance. The major U.S stock indexes are slipping into the red this morning, after notching a very solid green day yesterday. At last check the S&P 500 rests at 2,582 — less than 1% below its all-time high notched 11 days ago. So much for all the hand-wringing that accompanied Wednesday’s sell-off — when the S&P fell more than half a percent for the first time in 50 trading days. The economic numbers these last two days are undeniably good. Homebuilders are finally starting to catch up with demand for new homes: Housing starts grew 13.7% last month. Dozens of economists were polled by Bloomberg before the release of the number; none of them guessed the figure would be this strong. Permits are a better indicator of future homebuilding activity, and here too the numbers are super-strong, up 5.9%. Yesterday, the Federal Reserve’s industrial production numbers came out — registering a 0.9% increase for October. And the big driver was manufacturing, up 1.3% for the month — blowing away the “expert consensus.” At long last, the “hard data” are catching up to the bullish “soft data” we’ve seen all year in surveys of factory managers. True, a single month doesn’t tell the tale. But we’d be remiss to ignore it. And there’s the capacity utilization figure: 77.0% of the nation’s industrial capacity was in use during October — the strongest figure in 2½ years. Is there any explanation other than central bank money printing to justify this? Seriously? More than double the previous record? And they’re not even sure it’s real? 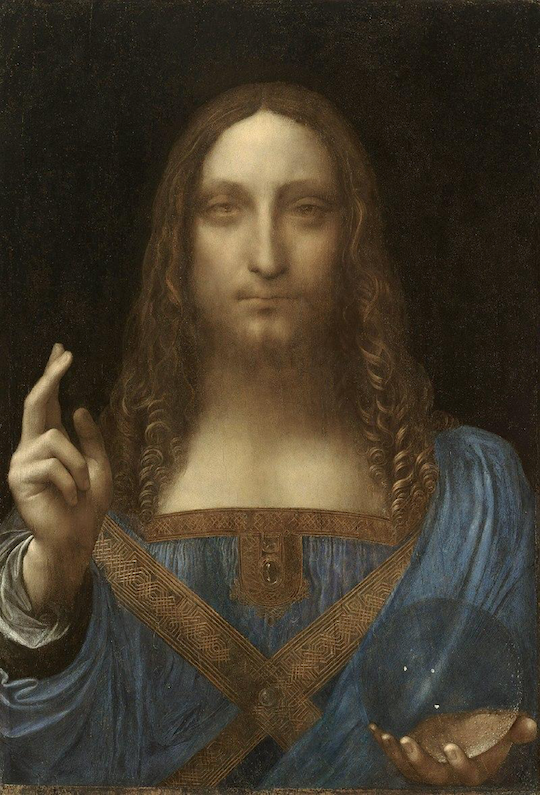 As you might have heard, a still-unknown bidder has claimed Leonardo da Vinci’s Salvator Mundi for the sum of $450.3 million — shattering the previous auction record of $179.4 million for a Picasso. Not bad for a painting whose authenticity is open to question among the experts. The Christie’s auction house was so brazen about its grab for cash that it didn’t put the work in the Old Masters part of the auction. No, that’s not where the money is; this da Vinci (if that’s what it really is) was right there in the Post-War and Contemporary Art Evening Sale along with a Basquiat and a Warhol. For real. It’s do-or-die time for tax reform. The House passed its version of the plan yesterday; the Senate Finance Committee passed the Senate version too, so now it’s up to the full Senate. Already one Republican senator says he’s a “no.” One more and it’s going to take a vice-presidential tiebreaker. Two more and it’s sunk. If this sounds like a rerun of Obamacare repeal, it is. At least so far. Is the coup in Zimbabwe really a Chinese play for the country’s mineral wealth? After three days, President Robert Mugabe emerged briefly from house arrest this morning; the BBC reports that the military “has been in talks with” the aging dictator. Zimbabwe is home to a host of mineral deposits including chromium, copper and the platinum group metals. China has a meaningful stake in some of those deposits. Mr. and Mrs. Mnuchin, why? Just why? On Wednesday, the Mnuchins — as in Treasury Secretary Steve and bride Louise Linton — unveiled new one-dollar bills bearing Steve-O’s signature. The couple paused for a photo-op, holding up a sheet of hot-off-the-press dollars… and then the photos went viral. Guy in the background: Can you believe this? You’d think they’d have learned their lesson: Americans don’t like rich folks showing off. 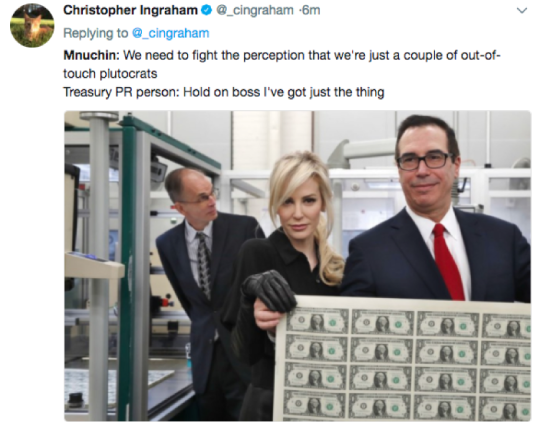 In August, we mentioned Mnuchin had commandeered a government plane to see the eclipse — at Fort Knox, no less — and posted pics of the jaunt on Instagram. We understand how cool it would be to have your signature on money (Look, Ma, my John Hancock’s on the dollar bill! ); Mnuchin even went so far as to change his signature so it’s actually legible… maybe he went too far, though, because it’s in script rather than cursive. But at the end of the day, a little humility, please. Ponder that photo for a moment: Steve looks like the cat-that-ate-the-canary and she, wearing a pair of a $1,100 gloves to match her Cruella de Vil ensemble, simmers away with a Mona Lisa smile. “Dave, perhaps a better question than what constitutes ‘an appropriate amount’ is what constitutes a competent authority? Heh? “Thanks for your issue on Russia and the Deep State,” a reader writes. “Also thanks for including the Time magazine cover of Boris Yeltsin and how the U.S. interfered in the Russian election. “There is a movement that is growing around the world to claim that any news story that does not fit the official narrative coming from the ‘official’ sources of the ‘trusted’ news organization to be fake news. Thought this originated in the U.S., it is rapidly coming to Europe. It will quickly lead to censorship on the internet both here and abroad. Today ‘the press’ now means the totality of news from four or five U.S. mega corporations, whereas 20 years ago it included 50–60 news organizations. “These mega-corporations include all radio, TV, newspapers and magazine content that Americans are exposed to. People search the internet for alternative news because news from ‘official sources’ does not answer the questions that the population is seeking answers to. The Deep State has recently tapped Facebook and Google to join them. “Over the last few months, Google has redone their search algorithms to prevent people from finding alternative stories. This has accelerated in the attacks on RT. It is the beginning of a new form of McCarthyism, this time promoted by the Democrats and the Deep State. Certainly, Ron Paul’s recent presentation of the origins of al-Qaida, which the U.S. and Saudi Arabia financed in the war against the Russians in Afghanistan, would be considered fake and the work of a Russian idiot. “Am I the only one to have noticed that when U.S. forces in Iraq took over from Saddam Hussein there was no attempt to guard the Iraqi military supply depots, thus arming the insurgents we then fought, or that this was repeated in Libya, where our proxy forces soon turned against us at the U.S. Embassy? Such embarrassments were never reported in the U.S. press. We have now been at war for 25 years fighting terrorism, which has increased dramatically all across the world. Yet we say that we are winning that war. One must ask how ISIS was allowed to keep its forces intact after being defeated in Syria. “I find RT to be more balanced and more focused on real issues than most of the TV news shows,” says our final correspondent. I also find that Al-Jazeera is usually in that category as well. P.S. There’s a textbook trade: Cisco delivered a handsome earnings “beat” yesterday… sending Alan Knuckman’s option recommendation in his 42-Day Retirement Plan advisory up 41% in only eight days. Only a few days remain during this quarter’s earnings season… and the profit opportunities aren’t quite over yet. For access, look here.